Yup, definitely saving it all just in case! Aw, so bittersweet. I can’t imagine all the loot I’ll have stored by the time he reaches one! I know, so sad. I do however, highly recommend those vacuum seal bags. I couldn’t believe his huge mountain of clothes fit in only one and half bags! Awwww this expresses just how I’ve been feeling about my lil guy growing up so fast and how hard it is for me to store away his NB clothes. I cry a little inside when he moves up to a new diaper stage! Love the poem,Melissa! 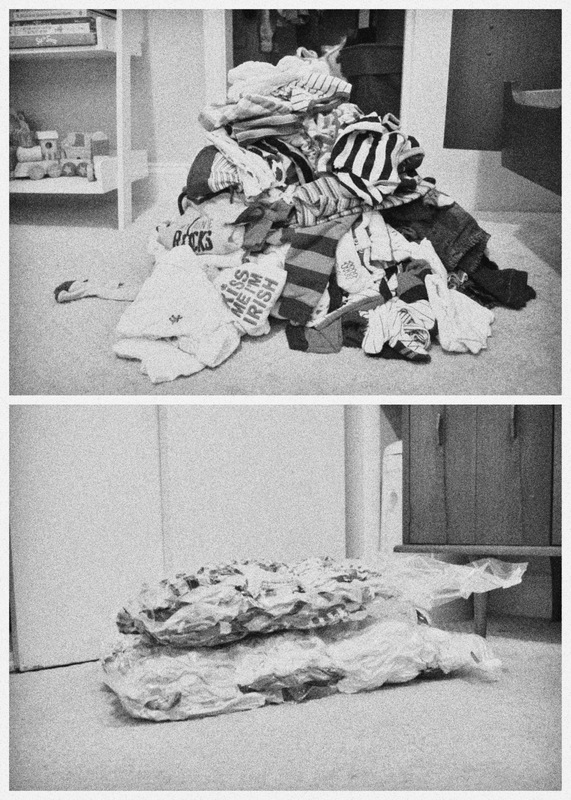 Oliver’s pile of too-small-clothes isn’t that big yet! Denial makes me still let him wear some of them, even if they are high waters! This is SO CUTE!! I used to get so sad packing away clothes thinking “she will never, ever be little enough to wear this again!” It IS sentimental, but it does get easier. Melissa, I hope you don’t mind that I provided a link on my blog to this post. I just loved this poem so much and think so many other mothers can relate! Of course not! Thank you & happy 5 months to your cutie!